Daisy found a foster in TX! Roscoe is a senior citizen in Austin, TX, who’s in the hospital fighting pneumonia. PACT is trying desperately to find a temporary home for his constant companion, Daisy. Daisy will need care in the Austin area beginning immediately and ending 4/30/2019. 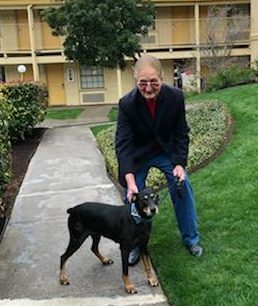 Daisy is a 10 year old, 55lbs Doberman Pinscher. She is spayed, up to date on her vaccinations, crate and leash trained. Daisy is quite indifferent to other dogs and would do well with another calm, senior doggy companion. Roscoe is unsure how she would do with cats or young kids. Daisy knows commands for sit and stay. Roscoe says that Daisy is very sweet and is his very best friend. Roscoe’s ideal foster home for Daisy would be kind to her and take her for walks daily. If you can give this sweet senior girl a place to stay while her dad makes a full recovery, please let us know! If you are interested in fostering wonderful pets like Daisy, please fill out a Foster Family Application. If you are interested and have already completed your Foster Application, please email info@pactforanimals.org and let us know!